Remember during Season 2 of Undisclosed how you could listen to Mark Free’s trial audio, but every time the Undisclosed team wanted to quote from Joey’s trial, Susan, Rabia and/or Colin had to read from the trial transcript? That’s because the judge and court reporter in Floyd County refused to release the audio recordings of Joey’s trial to either the Georgia Innocence Project or to the Undisclosed podcast. In fact, GIP was told that we couldn’t have the trial audio precisely because it would be used in a podcast! Never to take no for an answer, Susan Simpson and the Undisclosed team recruited some of the best appellate attorneys in Georgia to fight for openness in the courts and access to public court records, so that we all could listen to Joey’s trial. Undisclosed filed a motion to copy Joey’s trial tapes, and the Floyd County judge denied the motion, finding that while Undisclosed could listen to the audio tapes at the courthouse for $200 per day, they could not also copy the tapes. This ruling was wrong for so many reasons that Undisclosed appealed the decision up to the Georgia Supreme Court. Today, Undisclosed‘s lawyers from the Caplan Cobb law firm argued to the Georgia Supreme Court that we all have a right to hear Joey’s trial through the Undisclosed podcast. 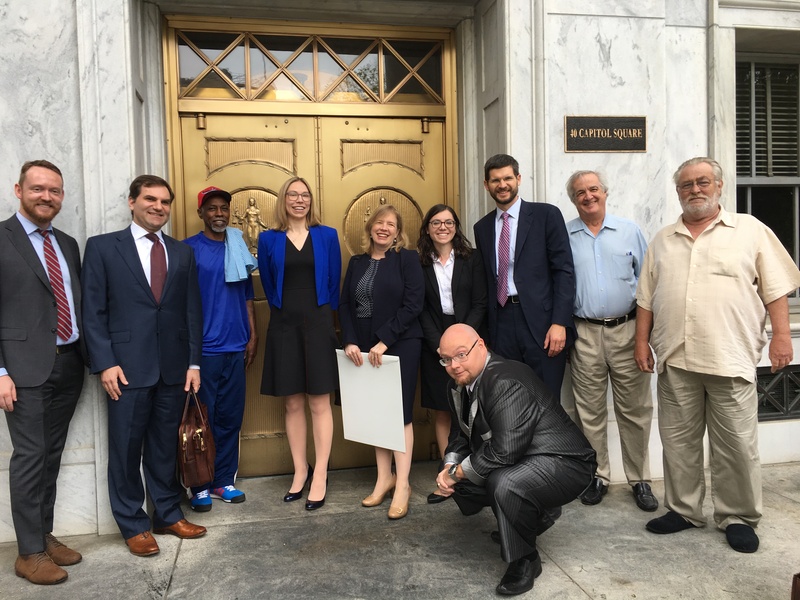 From left, Caplan Cobb lawyers Brandon Waddell and Michael Caplan stand next to GIP exoneree John White, then Susan Simpson of Undisclosed, Clare Gilbert from GIP, and Caplan Cobb lawyers Sarah Brewerton-Palmer and James Cobb, who argued the case. GIP volunteer attorney Carl Greenberg is standing next to Georgia exoneree Terry Wanzer. Georgia exoneree Justin Chapman is kneeling in front. Season 1 of the Atlanta Journal Constitution’s Breakdown podcast featured Justin Chapman’s case – and often played audio clips from Justin’s trial as part of the podcast. We, of course, agree. Without the right to copy, the public’s right to access court records is meaningless. And if access to court records does not include the right to copy those records, then GIP’s ability to investigate, litigate and highlight innocence cases grinds to a halt. We obtain copies of court records in 100% of our cases, and without those copies we’d never be able to figure out what happened in court before a case came to us, or how the jury came to convict an innocent person. Court proceedings and trials are open to the public, transcripts of those trials are copied and available to the public, and audio recordings of those trials should also be available to the public. Undisclosed and other investigative and media organizations rely on audio recordings to inform the public about the criminal justice system and to highlight breakdowns in that system. As you experienced first-hand in Season 2, a cold transcript doesn’t accurately portray the nuances of a trial such as Brianne’s voice as she tried to convince the courtroom that Joey stalked Isaac, or then-prosecutor Tami Colston’s tone as she made false representations to the court and argued to the jury that Joey was essentially an evil sociopath that murdered not only his classmate, but also two dogs. Further, charging $200 a day to sit in a room across from the court reporter’s office and listen to trial audio in real time without the ability to record imposes an excessive hardship on the public, the media and organizations like GIP. Joey’s trial was six very long days, often stretching late into the night. GIP has very limited financial resources and staff, and Undisclosed is not even based in Georgia. So to effectively listen and take notes on the audio from Joey’s trial would mean well over a week of round trip travel to Rome and well over $1000 in fees. Likewise, given how many calls we receive from family members every week asking us to investigate their loved one’s case, can you imagine their struggle to uncover the truth if faced with a cost of $200 a day just to listen to audio tapes? Through the lens of false and wrongful convictions, the promise of restoring justice to our courts begins with the ability to capture and understand the full extent of the proceedings against the accused. Without transparency and openness in our courts, justice doesn’t belong to the public — it belongs to those who administer it and those who can pay for it. We are hopeful that the state’s highest court decides to preserve Georgia’s long history of openness and accountability in our court system, which the public accesses through the right to view, hear, and copy court records. That should include the trial audio recordings in Joey Watkins’s case. 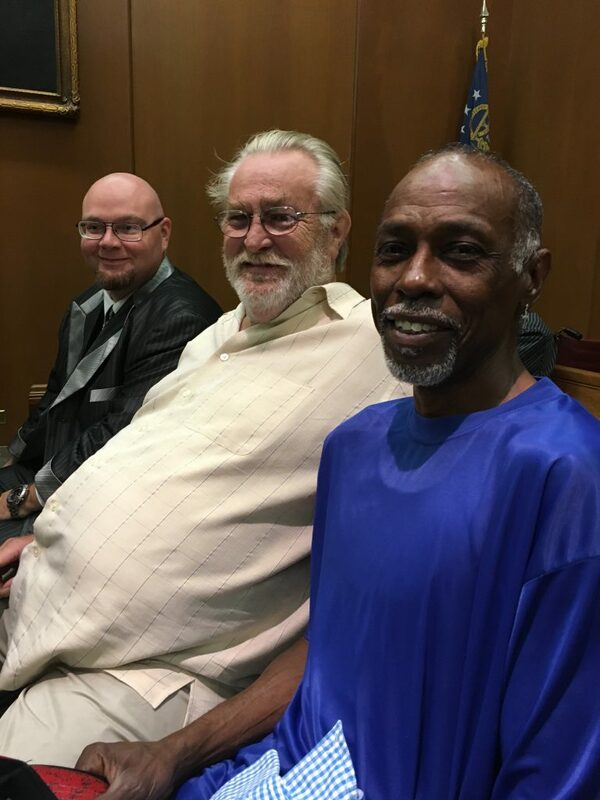 Georgia exonerees Justin Chapman (~9 years), Terry Wanzer (8 years), and John White (27 years) came to support Joey at the Georgia Supreme Court oral arguments. So, so exciting. Its tragic that access to info is so routinely blocked. Susan, you and your stick to it tive ness :))) is a game changer. Everyone, keep up the good work! Go GIP!!!!!!! We are rooting for y’all, and Joey, from California! Keep up the GREAT WORK, you guys are amazing! Yay for Undisclosed! Not taking no for an answer. Fighting, not only for Joey Watkins & his trial tapes but all the future wrongfully convicted who will get a real shot at being exonerated because of this fight! Susan- I just love you! Seriously! Rabia & Colin- you’re both amazing! Any updates yet? When can we expect a decision? I just binged on season 2 and after listening to an episode, I thought it couldn’t get worse – and then it did. Every episode got more and more unbelievable that it was actually hard to remember this was for real. Yay GBI for seeing past a self admitted “punk”to reveal the truth. Shame on you Floyd County. An embarrassment for Rome GA and everyone involved in this case, some more than others and you know who you are. The good people of Rome should not tolerate this. Surely there are some folks there with a conscience. 1.) Recruit a visually impaired attorney to assist you with the case. 2) Send him to the courthouse to obtain court recordings. 3) Threaten a ADA lawsuit if his access is made any more burdensome due to his visual impairment. I bet the recordings will become much easier to obtain. Great idea, using visual impairment as a ‘read the transcripts’ workaround. Why does it have to be a lawyer? Public records are for everyone, right? I just donated to GIP! I just finished Joey’s season on Undisclosed. As I am late to the podcast, I am wondering where things stand now. I listed to the end of season 22 with tears running down my face. When Rabia asked Joey about that day when the verdict was read. His choked up response. Have we heard any news on this? I would love an update on Joey’s case. The days keep passing and he’s still unjustly behind bars. I appreciate all the work done to this point. Praying for a good outcome that sets Joey free. Just listened to Joeys case and was horrified at his unjust conviction. Scares me to look at my four kids and realize this happens and could happen to anyone anywhere. Donated and will continue to do so to free those wrongfully and unbelievably convicted. Thank you for working and giving a priceless opportunity to all those you help.